I seem to have lessened Thursday’s troll threat through a combination of blocking and a cease and desist notice. But I’m left shaking my head at the whole thing. Several days ago, I read a comment on a blog post about the trolls’ target, which made a lot of sense. It said, basically, if you have so much evidence that this person is a scammer, then give that evidence to the police and be done with it. Especially if they took your money or something like that. If it was just that you thought you found love but they were a fake, then chalk it up as a learning experience and move on. The commenter did not understand all the fuss over this person, the websites, the vitriol, the trolling. I feel the same way about it. If this person is truly a scammer, then give it to the police to sort out. Don’t waste your time with setting up hate websites and constantly trolling a person. If they are truly a scammer, then the police will press charges, and nobody else will fall victim. Because that’s all I see here, a big waste of time. Over the years, I have checked out a lot of blogs posted by victims of all sorts of things: various crimes, stalking, sexual abuse, emotional abuse, physical abuse, narcissism, gaslighting, etc. etc. For the most part, the blogs are a journey from the initial hurt and pain and anger, on to a particular endpoint. I say “endpoint” because oftentimes blogs end before they get to full acceptance and healing. But there’s usually some point they get to. Maybe they leave their abuser. Maybe they write about the healing process. But it’s all about venting and then recovery. But I’ve also seen hate sites, which complain about abuse but seem to be written by narcissists. They never get beyond the anger-phase, just sit and stew for years, maybe even contemptuous toward people who do want to heal or forgive. They are full of potential libel, and probably the real name of the offender. You can tell the site is meant to tear down that other person’s reputation, and make all readers hate the person as well. I saw one such site which was so full of vicious personal attacks that I was not surprised to come back much later and find it gone. Apparently the blogger was forced to remove it. There is another blog–I have not actually seen it, but I’ve read about it from bloggers who have seen it. Basically, its sole purpose was to rip on the guy who runs Harsh Reality. It does not seem to have been taken seriously. As for the trolls who have targeted me, I don’t understand their obsession, either. As noted above, if they have evidence, give it to the police. Or let the victims call the police. That’s what the police are there for. They also have access to resources we regular people don’t have. They can sort out true from false, real victims from fake, true leads from people who just want a little fame and attention. (There are actually people who say they did a crime or know something, when they have nothing to do with it whatsoever.) They can get things moving in the legal system. What’s up with the websites? What’s up with spending all that time setting up hate sites, making fun of a person nonstop, stalking their Twitter nonstop, and bullying complete strangers into agreeing with them? If someone sees your site and thinks you’re full of bullcocky, then cyberstalking them, sending them high-school mean-girl messages, screwing with them, and bullying them into agreeing with you–Okay, you have no clue how persuasion works. I mean, come on, how am I supposed to take these people seriously? If you have a case to make, then simply stating the facts in a mature and reasonable tone should convince people. If it doesn’t, well then, that’s their opinion. Move on. But when you act like a group of children, most people are going to dismiss you as childish, along with any points you’re trying to make. If you think you have to force and bully people into agreeing with you, then you must realize your case has not been made. Now, I look at this particular case, the claim that one person is a scammer, with curiosity. Sure, I’m interested. Sure, I’ve spent time Googling the person. I’m still curious, especially now that I’m getting cyberstalked over it. And laughable, when you think about it. The more I think about it, the more ludicrous it gets. I mean, when you get down to it, I have my own opinion on the matter, but I could be wrong. I accept that as a possibility. If I am wrong, then the world is not going to shrivel up and die. Heck, my own piece of the world is not going to fall apart. I will not be personally affected. And a huge chunk of me really doesn’t care one way or the other. Most of the time, I don’t even think about it. Then the alleged scammer posts something, I get a notification in my inbox, and I think, Oh yeah. If I’m right, then hey, I can rejoice that I figured it out. I can write about the effects that mob-bullying and cyber-bullying can have on a person, and what it must be like to be in the Kafka-esque position of insisting that you exist and are not a figment of somebody’s imagination. If I turn out to be wrong, then what does it become for me? It becomes an intriguing little example of how far twisted some people can be, how far they can take a scam. And that is useful for both this blog and for my novel-writing. It seems like a huge time-waste to me, full of haters and libel, no matter what the show. People ripping on the clothes/hair/appearance of the people on the show. People making up schoolyard epithets for the people on the show. I’d much rather spend that time creating, reading and learning. The most I usually do is spend some time in Facebook groups for my two favorite reality shows, and then only while the show is running new episodes. Then I forget about it. But I get the impression from the gossip blogs that these trolls are not actually victims of the alleged scammer. Yet for some reason, they have all decided that it is so earth-shatteringly important that everybody in the world share their obsession, and agree with them that this person is a dangerous scammer, that they feel the dire, driving need to hunt down all dissidents and bully them into believing as well. Now because of this, I’m getting disturbing messages through my blog: The ex-troll scolds me for not believing (even though I specifically wrote on my blog that I don’t know who’s telling the truth). She says she doesn’t care, but the tone and words of her message make plain that she does. The trolls behave like they have a collective age of 12: relentlessly stalking me and others, using Facebook to harass, sending me snarky messages. Then one seems to extend a hand of repentance, but another turns snarky and derisive. Okay, so this was all some high-school game by mean girls. Ridiculous. I was scared for a while, but now I’m starting to chuckle. And snort. I block them, knowing they’re just going to use proxies, but why make it easy for them? I chuckle as I block another one. And the derisive messages trying to make me feel like some kind of idiot, or shame me into compliance. Because I don’t care what these people think of me. I shut off the computer and they vanish. Because well, it really isn’t that big of a deal what I think about their scammer. Just another curiosity in the reality show world. It only really matters to the people directly involved. But this whole thing becomes an odd little demonstration of just how obsessed some people can get. It has been suggested that people get like this these days because they’ve spent so much of their lives in front of screens instead of interacting with people, that they don’t understand what’s appropriate. They give into their ids instead of using courtesy and respect. 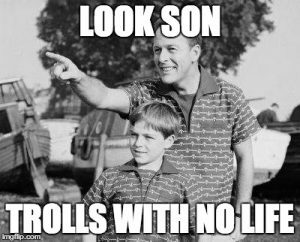 Except–Well, even my kid understands that trolling is wrong, despite his introversion and love for the computer. As much as I want to open up the conversation to my readers, I have to shut down the comments. Because you know the trolls are lurking, watching for anything about them. Meanwhile, I have to get to bed because some of us actually have stuff we’ve gotta do. I especially agree with the part about, how hard it is to convince people why you’re terrified over seemingly harmless acts. Right about this time, right after I publicly talk about stalking, the questions come in about being stalked. Here’s the catch-all answers for the common questions that people ask me, and other crime victims. …2. Why didn’t you tell me all the details while you were being stalked? Answer: Stalking is confusing, terrifying and devastating. It consumed my life. Did my best to not burden any one friend with all the details. Trauma in general is simply a horrible, horrible thing to let drop in casual conversation. Sometimes, just I needed to talk about something else, unrelated to the big bad scary.